People want to know who you are and what you do in a brief but interesting way. Gone are the days where people would take the time to really get to know you. We live in a world where the first impression is the only way you will get any further chances to make an impact. If you want to have influence, you need to be a brand. In the last post we discussed how Starbucks gets this. In fact all contemporary, successful companies have to get this… or they will die. Individuals have to get this figured out as well. The consequence for us is not that we might die, but rather that we will will be come irrelevant. Action Step for Today: Create a personal tag line that describes you… like the brief descriptions that help us select our Starbucks coffee. Use no more than a few words. Preferably less then a sentence. The important thing here is not to create some fictitious you… this needs to be an authentic and concise description of who you are… the tough part is to make is catchy. I have two sets of these personal tag lines. They are works in progress. They define me and project who I am seeking to be every day. Here they are. Who I Am – Husband. Father. Teacher. Dreamer. Climber. Servant. Follower. Leader. If you have been to my blog, you’ve seen both of these sets of descriptions. This is who I am and what I do. Who are you? What do you do? Once you have figured out what your brand is… promote it relentlessly. Talk about it, tweet about it, post about it, blog about it. The tag line isn’t enough. You need a consistent and relentless push backing it up. If you do this you will be One Grip Higher! If you want a fun way to get started on this look at the list of Starbucks coffee below and figure out which one best describes you (this will not get you One Grip Higher… But will be fun!). I am most like “Sumatra – Intense, earthy, and aromatic.” What about you? Latin America – Great balance, medium body and a clean finish. Colombia Nariño Supremo – Full-bodied with satisfying walnut flavours. Guatemala Antigua – Elegant and intriguing. House Blend – Light and lively. House Blend (Decaf) – A well-rounded, lively favourite. LightNote Blend – Smooth and delicate with a clean finish. Organic Shade Grown Mexico – Crisp, refreshing aftertaste. Starbucks Breakfast Blend – Flavourful and light with sparkling acidity. Africa/Arabia – Floral aromas with citrusy exotic flavors. Arabian Mocha Sanani – Wild and exotic, with an aroma of spice. Ethiopia Sidamo – Smooth and elegant, with a floral aroma. Kenya – Bright citrus notes with deep aroma of fruit and wine. Asia/Pacific – Full-bodied and earthy with herbal undertones. Komodo Dragon Blend – Earthy and smooth bodied. Sulawesi – Smooth, buttery, earthy and elegant. 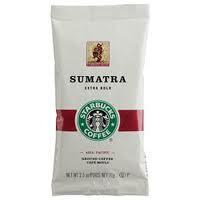 Sumatra – Intense, earthy, and aromatic. Dark Roast Blends – Carmelly-sweet and and smoky flavours. Espresso Roast – Dense and caramelly-sweet. French Roast – Our darkest roast, smoky and intense. Italian Roast – Sturdy and roasty-sweet. Multi-Region Blends – Superb interplay of aromas and flavours. Caffè Verona – Full and creamy, with a sweet finish. Serena Organic Blend – Smooth acidity with citrus & floral aromas. Yukon Blend – Mellow and well-rounded.